COMMENT (By a soul): The following is a 18-page Preparation Summary for the End Times. The Summary has been compiled by volunteers using messages from the Book of Truth as given to Maria Divine Mercy. I promise you that the persecution will be swift and that you will be protected. For I now bequeath the Seal of My Love and Protection. Your Divinity encompasses my body and soul for eternity. I bow in humble thanksgiving and offer my deep love and loyalty to You, my beloved Father. I beg You to protect me and my loved ones with this special Seal and I pledge my life to Your service forever and ever. I love You, dear Father. Go, My children, and do not fear. Trust in Me, your beloved Father, Who lovingly created each of you. I know every single soul; every part of you is known to Me. Not one of you is loved less than the other. Extract “You must not accept the Mark. Instead I will instruct you what to do. Many will accept the Mark because they will feel helpless. The Seal of the Living God, My Crusade Prayer (33) is your lifeline. 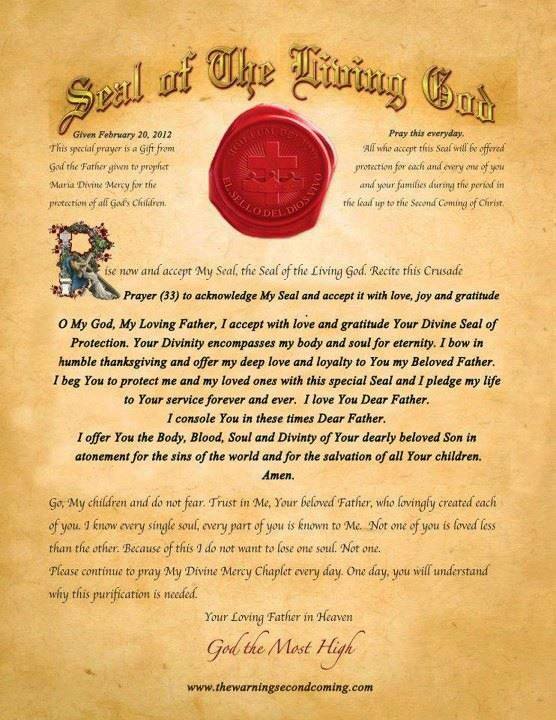 When you receive My Seal of Protection, given to you by My Eternal Father, you will not have to accept the Mark. You will not be touched. Your home will not be seen, searched or a target for it will be rendered invisible in the eyes of Satan’s army. My Remnant Church will grow and spread out and you will be given shelter if it is needed. Much planning is needed now. Those who laugh at what you do, or say, surely Jesus would not ask you to do this? Does He not supply all His followers at their time of need? Only focus on the saving of all souls. This is why you must ignore the obstacles presented to you. The persecution. The pain. The horror of evil by the hands of others. All that matters is the saving of souls. Extract “Plan your food supplies now. Grow and buy seeds that will keep you alive. Buy silver coins or gold, so that you can buy what is necessary. Most importantly find locations where, as a group, you can meet to offer the Holy Sacrifice of the Mass. For in time, your churches will be burned to the ground. Never accept the mark, the chip of the beast. Pray, pray that your home will be given the special blessings to safeguard you from the army, which will try to put you out of your home. Satan’s minions are like ants. They multiply in their thousands by the hour. You, My children, must pray now and fight this series of atrocities being planned by the New World Order, who salivate at the prospect of controlling the world. Plan to have blessed candles in your home. Stock up now for they will keep you in the light of protection. Unless you wish to become a slave to this hideous doctrine then you must plan now. Extract “Plant seeds in order to feed you and your families, during the persecution. I do this for a reason. You must plant, even just a few seeds – pure seeds, which have not been tampered with by human interference. I will then multiply the fruit, which they will yield and all will have enough to eat when the world will experience great hunger. Have plenty of water because everything you store will be multiplied by Me. My dearly beloved daughter, I told you all, some time ago, to plant seeds in order to feed you and your families, during the persecution. I do this for a reason. You must plant, even just a few seeds – pure seeds, which have not been tampered with by human interference. I will then multiply the fruit, which they will yield and all will have enough to eat when the world will experience great hunger. Those days are not far away and they will come about for a number of reasons. The crops will be contaminated through the intervention of greedy farmers. The result crops will be unfit for you to eat. Then war will mean that few men will be able to till the land. Then there will be the fire, which will pour over the four corners of the earth, and everything will become barren. These terrible trials will be caused by the spread of evil, but many people will survive if they trust in Me. You must prepare now, as if a war is coming and as you would when food is rationed. Have plenty of water because everything you store will be multiplied by Me. Please do not believe that I ask you to leave your homes for this is not necessary. A little preparation, where you offer help to each other, is all that is needed. My Precious Blood will cover all those who believe in My Warning to humanity for the time of the Third Seal to open will follow a time of war. So many will ignore the Word of God, which is contained in the Book of Revelation. So many leaders and sacred servants in My churches, fail to respond to My prophet, just as they did before the flood. I call to My sacred servants, now. Who do you believe in? Me, your Jesus or the ramblings of those who claim to be experts in theology, but who are ignorant of the Truth? Wake up. The Seals are being opened. Your duty is to help Me to save souls, but you have not remained alert to the sound of My Call. I have told you that I will come like a thief in the night. When that day comes it will be too late for souls who have not prepared. I must remind you that your role is to save souls. You do this through a life where you are supposed to serve Me and not where you pander to the pride and ego of those who try to twist My Teachings. Many of you in My churches do not understand the meaning of My New Paradise and have failed to remind God’s children of My Promise. You must remind them of the Truth – of the time, before the final day. So many of you, though kind, good, loving and with a sincere commitment to My Church on Earth, forget about My Second Coming. What do you think this is and what have you learned? How many prophets would it take to convince you that the time is almost upon you? When your faith is weak, you cannot open your heart to Me. If you opened your heart to Me, you would be able to hear Me clearly, for you would be filled with the Holy Spirit. Sadly, many of you, who say you serve Me, are not fit to stand up and declare yourself to be a servant of God. You make Me ashamed and you shame My Name, when you publicly humiliate your flock in My Name. You break every rule of God when you condemn those who follow these Messages, for you have not been given the authority to do this. Your love of self takes precedence over your love of Me, Jesus Christ and because of this, you are no longer fit to serve Me. You are too proud to stand before My Throne. Many are already being formed every day. I thank those who have followed My instructions and show obedience. Be at peace. You must be more confident. Leave fear aside as it is not from Me. We are now growing and spreading to every corner of the earth. Soon all will follow and when that happens, the prayers will change the world through conversion. People will be forced to accept sin in their countries and it will become an offense for Christians to object to these laws. Christians will be viewed as being uncharitable, right wing and out of touch with the human rights of others. Every trait, desirable in souls, as laid down by my Father, will be used as a front in their efforts to justify such wickedness in your nations. I urge you to keep all holy objects, rosary beads, blessed candles, holy water, a copy of the Bible and the holy daily Missal along with the Crusade of Prayer book. You must keep the Seal of the Living God in your home and on you if possible. Extract “Prayer is your armour now, children, between now and the time for The Warning. Use prayer to save souls in darkness. After The Warning, your prayers will be needed to help My children retain their devotion to My Eternal Father and to praise His Glory. By reciting three or more Rosaries you can extend this protection for others. If even a hundred people could do this they could save their nation from the contamination spread by the evil one. You must gather together children and pray to protect yourselves. Only then will you be filled with peace, courage and the determination to become part of God’s army. This army, already forming, is made up of the multitudes across every nation. They will march to the end and cannot be defeated. I must urge you, dear children, to remain strong and faithful to the Holy Word of God, for the sake of my Son. He, my beloved Son, hangs His Head in agony as He watches the horror as His Church crumbles before Him. My children, you will always be tempted into sin. Perfection of your souls is extremely difficult to attain and requires a tremendous discipline and determination on your part. If and when you fall prey to the evil one’s seduction and commit sin, you must immediately pray from your heart and seek forgiveness. Regular Confession is a Sacrament much misunderstood. It is only by weekly attendance in the confessional that your soul can remain in a state of grace. When your soul is sanctified in this manner and through daily prayer, only then can you can keep the deceiver at bay. Never be embarrassed to ask for forgiveness when you are truly remorseful. But remember also that when you don’t, you will attract the deceiver again and again and your soul will plunge into darkness. Darkness attracts dark. 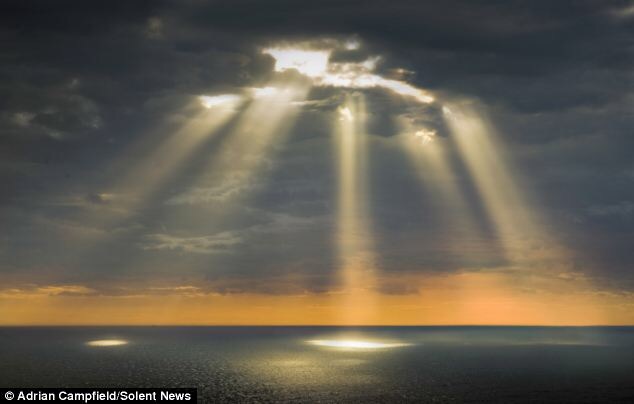 Light attracts light. I Am the Light. Extract “There are only three ways to protect yourselves from the evil one. 1. The first is, the Sacrament of Confession cleanses your soul, if you are genuine in your remorse. For non-Catholics please accept the Gift of the Plenary Indulgence in Crusade Prayer (24), given to the world through this Mission. 2. The second way is through the daily devotion to My Mother who has been given the power to crush Satan. Her Holy Rosary is an important shield, which will cover you and your family away from his evil eye. My army, through their love for Me, will be given very special graces now. I grant them this Plenary Indulgence to enable them carry My torch of fire so that they can spread conversion. This gift from me will enable them to spread the truth of My Holy Word so that it will touch hearts everywhere they go. “O my Jesus, You are the Light of the earth. You are the Flame that touches all souls. Your Mercy and Love knows no bounds. We are not worthy of the Sacrifice You made by Your death on the Cross, yet we know that Your Love for us is greater than the love we hold for You. Grant us, O Lord, the Gift of Humility, so that we are deserving of Your New Kingdom. 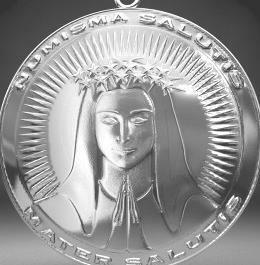 We offer ourselves, our sorrows, our sufferings as a gift to You to save souls. Go forth in peace My beloved followers and remember that your love for Me enkindles My heart and brings great joy to My Eternal Father, My Blessed Mother, the angels and all the saints in Heaven.